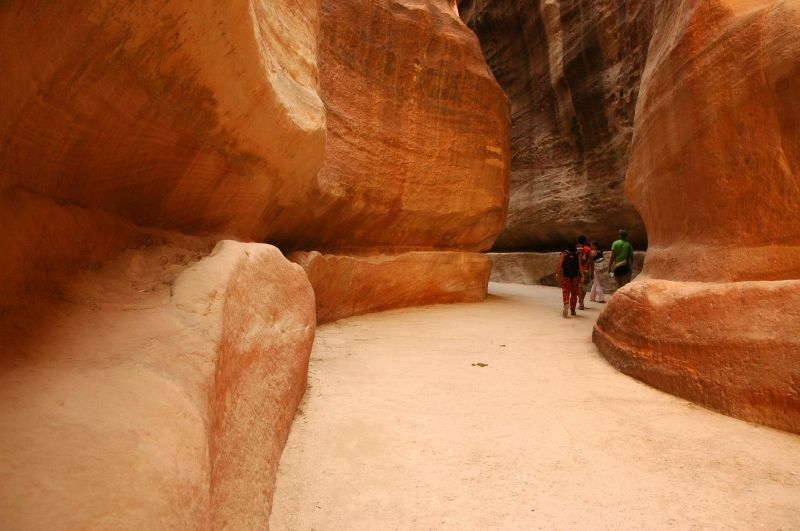 Who has not been astounded by the beautiful ghost city at Petra? 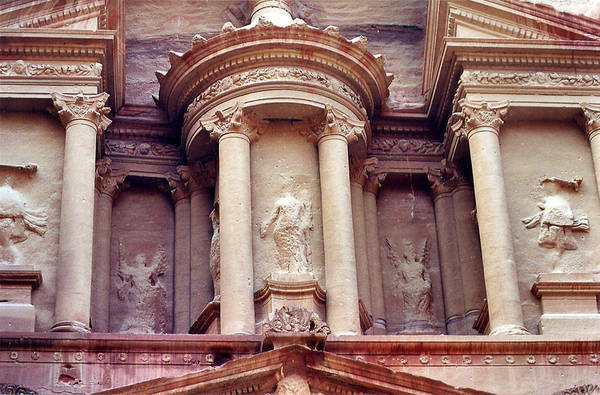 Intricately carved from living, rose-hued rock, many of Petra’s ancient buildings have survived while their free-standing contemporaries have not. Petra is in modern Jordan. It may have been established as early as the 3rd or 2nd century BCE and was the capital city of people known as Nabataeans. Petra—the name comes from the Greek word for “rock;” we do not know what the Nabataeans called it—was built into a rocky slope of a mountain and near a wadi, a valley that is dry except during the rainy season. Nabataean architects and engineers are famous not only for the incredible buildings of Petra, but also for their brilliant control of the water supply. They were able to contain and store the waters of the flash floods to which the wadi was subject and to manage the flow of a small stream that was Petra’s sole ongoing water source. The work they did turned this desert city into an artificial oasis and enabled its caravan trade to flourish. Petra is one of the world’s most precious cultural sites, and like most of them, is threatened by both environmental conditions and tourism. As you no doubt expect to hear by now, Isis was to be found in ancient Petra, just as She was throughout much of the Mediterranean world. She may have been brought there with Alexandrian craftsmen when they came to work at Petra, or by Nabataeans themselves who encountered Isis either in the Levant or in Egypt. We know of Nabataean settlements in the eastern Delta of Egypt. 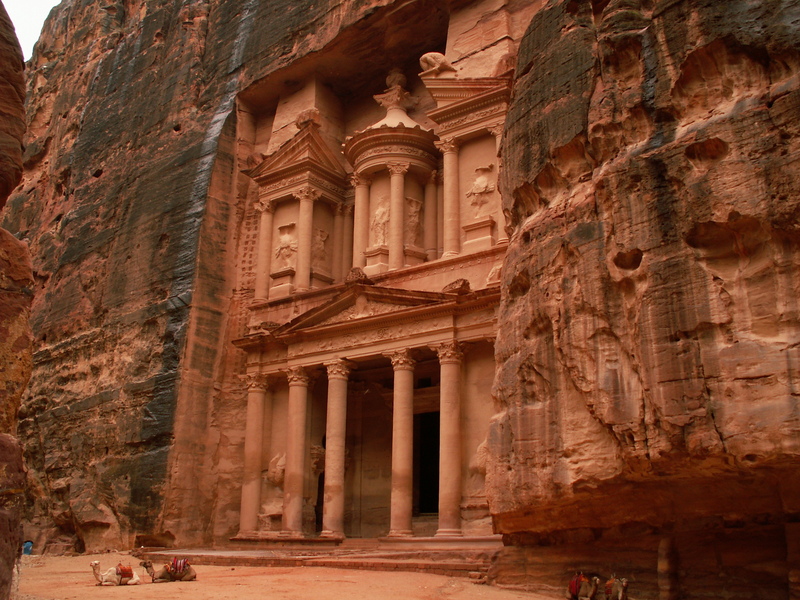 The earliest date to which researchers are willing to commit for Isis’ arrival in Petra is 25 BCE. 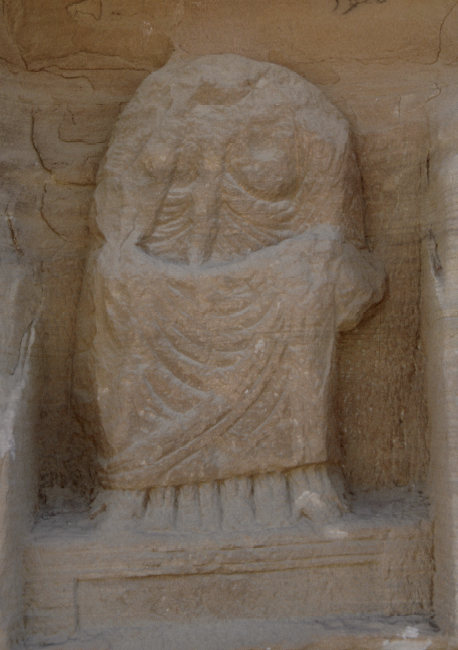 A sanctuary at Wadi as-Siyyagh on the outskirts of Petra includes an inscription that labels one of the rock-carved images there: “This Goddess is Isis.” The way the inscription is phrased and the ambivalent iconography of the image makes researchers think that Isis was being newly introduced to Petra at the time. On the other hand, the Oxyhrynchus aretalogy of Isis, to which we have referred many times, notes Isis as being called Savior “on the rock,” which may mean Petra. 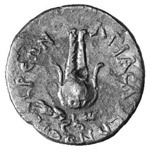 The aretalogy itself dates to the 2nd century CE, but its contents may go back to the 3rd or 2nd century BCE. Generally, scholars don’t accept this as solid enough evidence for Isis in Petra that early, nonetheless, it’s interesting. We know that She was honored in Petra in this aspect because of several Sorrowing Isis terracotta figurines found in what is known as The Temple of the Winged Lions, or “North Temple” if you want to be boring about it, as well as similar images found in other excavations throughout the area. The most spectacular piece that was uncovered in the Temple of the Winged Lions is a rectangular stone with a female face on it inscribed ”Goddess of Hayyan son of Nypt.” Some have suggested that the headdress wreath once contained an Isis crown and thus have tried to say that the temple belonged to a syncretic Isis + Local Goddess, but I’m going to have to vote with the scholars who deny it on this one. 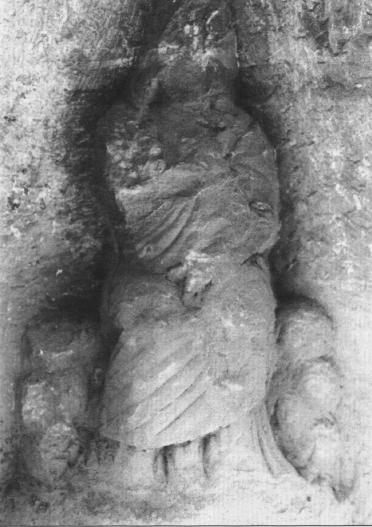 Excavating a rubbish heap that covered older Petran homes, British archeologists found terracottas of Isis with Harpokrates dating at earliest to the 1st century CE. 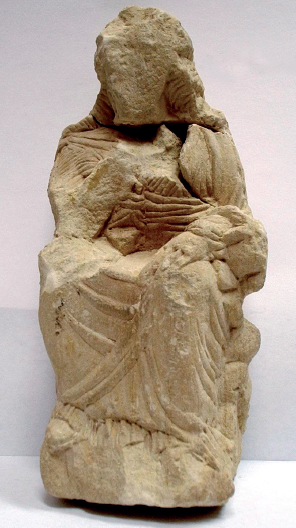 There is also an alabaster fragment of an Isis statue from ez-Zantur, another area in Petra, probably from about this same time. They have even uncovered a pottery workshop outside of Petra where they were making Isis images in addition to votive images for other Deities. There is another Isis sanctuary at Wadi Abu Olleqa, again outside of Petra but on one of the main routes. 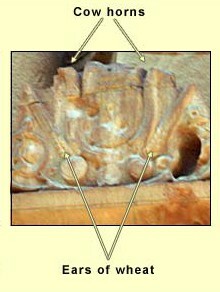 There we can easily see the Isis knot on the now-headless image’s breast. 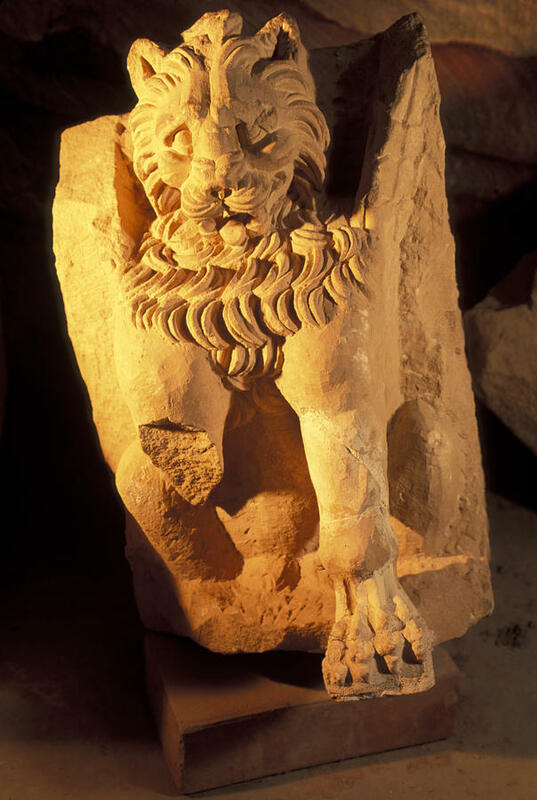 Some have tried to connect the central figure on the famous Treasury, originally built as a mausoleum and crypt, to Isis. She seems to be a standard Tyche, the Luck of the City, with cornucopia in hand. Yet beneath Her feet is what does indeed look like it might be the horned headdress of the Cow Goddess (long associated with Isis by this time) with stalks of wheat flanking the horns and perhaps (I can’t make it out) the Amun feathers between the horns. Vaelske seems rather amazed by that fact (exclamation points were used!) 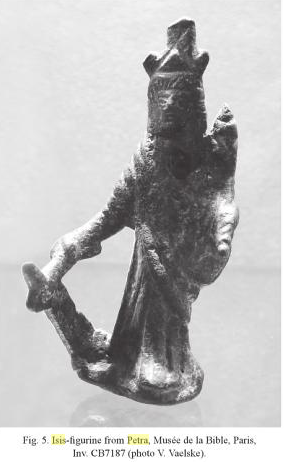 and thinks that this solitary Isis may be a particularly Nabataean form of the Goddess. I’m not sure that’s entirely justified. By this time, Isis’ worship was so thoroughly disseminated that any Isiac, and even non-devotees, would know exactly why She sorrowed. The Goddess’ image needn’t have been paired with a dead Osiris to communicate the extremely well known myth. Or perhaps, as I mentioned before, this lone and mourning Isis could be intended to represent the Savior Goddess Who sorrows for all of us as we each pass through the tribulations of our own lives. You asked about Abdisi and Thimisi. Abd means, “Servant” and implies “Servant of” so Abdisi would be “Servant of Isis”. You see this in a lot of modern Arabic names that start with “Abd Al” or “Abdul” which are followed with one of the names of Allah. I am not so sure about Thimisi, though.